Warehousing. Efficiency. Productivity. Three words that always go hand-in-hand. In the age of Amazon, every warehouse facility is expected to meet the pick-and-ship mentality of today’s consumer. 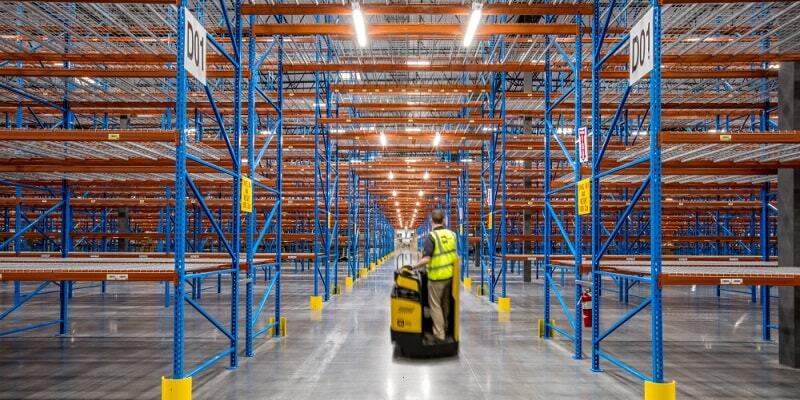 Luckily, this has spawned a new generation of warehouse solutions that helps your facility stay sharp in this increasingly competitive industry. After all, what’s a warehouse if it’s not productive? E-Commerce sales last year in the United States alone was $453.5 billion… billion. Over the last few years in response to the steadily growing digital market, autonomous machines have taken rise over the piloted equipment for accuracy and safety. Balyo technology is designed specifically to safely navigate and interact with your warehouse design. Yale trucks with the Balyo software can be not only fully autonomous, but also highly customizable depending on the evolving warehouse needs – because, as you know, the demands of the consumer can be rather fickle. If that level of autonomous AI isn’t something you’re quite ready for, take a spin with “cobotics.” Similar to robotics, your team works alongside the semi-autonomous machines. This restructures your labor into more value-added positions so your machines can handle the monotonous repetition. Warehouse productivity is contingent upon the equipment you use and the people you employ to manage your supply chain. With personnel added, safety has to be a priority. Businesses spend $170 billion per year when it comes to handling occupational hazards… But think about it – when you lose valuable man hours to a preventable injury, you’re losing productivity. It pays to be safe. Enter Yale. Yale Vision provides a satellite-based GPS functionality as part of the asset management system. Not only does it give real-time insights into any faults or accidents, it gives your fleet management team the visibility to lift truck activity – i.e., better visibility to warehouse productivity. Keep in mind, not all on-the-job injuries are extreme. They can be the result of years sitting in an old forklift that’s anything but comfortable. Ergonomics are a major player in operator awareness and productivity. In recent years, manufacturers like Yale have made great strides in ergonomic development to help reduce the number of repetition-related injuries. Picture this – you’ve got 40-foot steel girders that you need to move from point A to point B in your warehouse. With the equipment you have, your only way to move that into your racking is to lift it above the racking on a traditional forklift. Obviously, that’s not only unstable, it’s unsafe and awkward. What’s the solution? CombiLift. These pieces of equipment are specially designed for long and cumbersome loads. The multi-directional forklifts from CombiLift combine the qualities of a counterbalanced forklift, side loader, and VNA truck in one machine. When you use a machine created for a specific job function, your facility is more productive, storage-efficient, and safer. The equipment you choose for your warehouse is dependent on your warehouse design, technology, and labor structure among many other variables. All of the pieces of your warehouse puzzle ultimately have an impact on your ability to meet consumer expectations. These three manufacturers represent a fraction of the resources at the fingertips of our Papé Material Handling team. If you’re looking for a turnkey solution to increase your productivity, give us a call. We’ll be glad to find the right solution for your warehouse. Looking for a turnkey solution to increase your productivity? Papé Fleet Services manages your fleet by taking information and turning it into insight— insight that will enable you to make decisions both quickly and easily. Standard forklifts are ineffective at handling long or bulky loads; they require significant open space to maneuver and can be dangerous if the operator exceeds load center requirements. Many operators resort to carrying loads high to avoid obstacles, but that, too, is unsafe. If your goal is to increase uptime and profitability, you’ll need actionable data to do it. With a high-quality fleet management system, you can monitor everything your operators and fleet are doing—24/7—and make necessary improvements.